Wolves have many ways in which they behave and communicate with each other. Wolves have a variety of expressions and moods that can be defined by subtle body movements like a shift in body weight to more obvious ones such as rolling on their backs on the floor in a submissive position. Below are some of the ways wolves show their behaviour towards each other and towards others such as predators or other threats. Dominant Wolf – A dominant wolf stands stiff legged and tall. Their ears are erect and forward and the hackles bristle slightly. Often the tail is held vertical and curled toward the back. This display shows the wolfs rank to all others in the pack. A dominant wolf may stare penetratingly at a submissive one, pin it to the ground, ‘ride up’ on its shoulders, or even stand on its hind legs. Angry Wolf – An angry wolfs ears are erect and its fur bristles. Their lips may curl up or pull back and the incisors are displayed. The wolf may also snarl. Aggressive Wolf – A aggressive wolf may snarl and crouch backwards ready to pounce. Hairs will also stand erect on its back. Fearful Wolf – A frightened wolf will try to make its body look small and therefore less conspicuous. Their ears flatten down against the head and the tail may be tucked between the legs, as with a submissive wolf. There may also be whimpering or barks of fear and the wolf may arch its back. Defensive Wolf – A defensive wolf lays its ears back flat against its head. Suspicious Wolf – A suspicious wolf will narrow its eyes and pull back its ears. Its tail will be pointed straight outwards parallel to the ground if it suspects danger. Relaxed Wolf – The tail of a relaxed wolf will hang down relaxed or it may wag. The more its tail hangs down, the more relaxed the wolf is. The wolf may also sit like a sphinx or roll on its side. Happy Wolf – A happy wolf will wag its tail just like a dog and will have its tongue lolled out. Playful Wolf – A playful wolf holds its tail high and wags it. The wolf may frolic and dance around, or bow by placing the front of its body down to the ground, while holding their rear high, sometimes wagged. This is reminiscent of the playful behaviour displayed in domestic dogs. 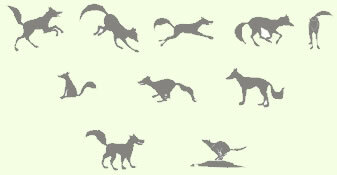 Hunting Wolf – A hunting wolf will be tense and have its tail pointing straight out. Submissive Wolf (Passive) – Passive submission is more intense than active submission. The wolf rolls on its back and exposes its vulnerable throat and underside. Their paws are drawn into the body. This is often accompanied by whimpering.